This has been a year of much loss in our industry. We likely have all been touched in some way by the passing of Val Cushing, Angela Fina, Joan Mondale, Kirk Mangus, Regina Brown, David Gilhooley, Nils Lou, Gwynn Hanssen Pigott, Paolo Soleri, Martha Longenecker, Eric Abraham, William Burne Knoble, Chris Strecker, Abraham Cohn, David Yunger, Alejandro Santiago, Mary Bohan, James Kemp, Lizbeth Stewart, and Allan Buitekant. Be sure to check out the NCECA Journal, beginning on page 13 for information on all of these ceramic artists and their contributions to our field. Once known as the “Eulogies”, the annual Past Masters session at the conference is an opportunity to gather together in memoriam and also to celebrate the lives of those we have lost. 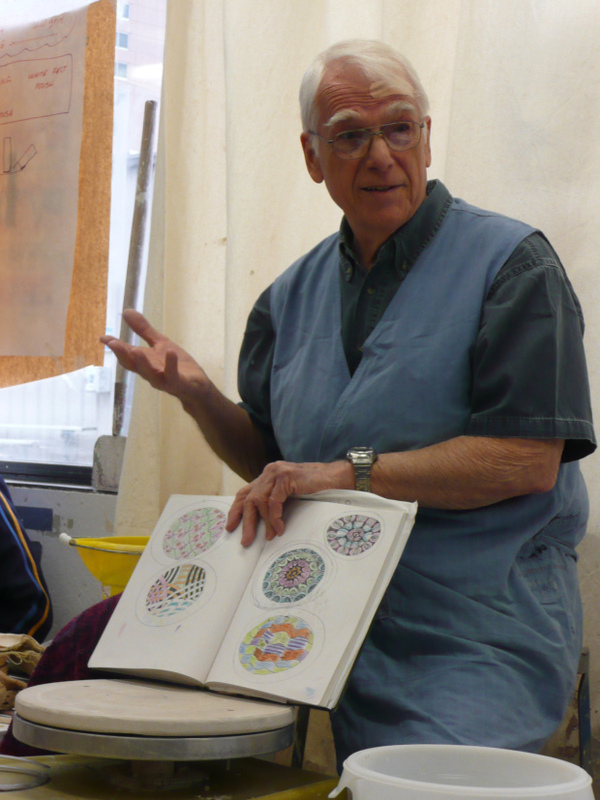 Val Cushing’s commitment to his own work was matched by his devotion to teaching. A founding member and former president of the National Council on Education for the Ceramic Arts, he saw the democratization of knowledge and opportunities as an essential American hallmark, and the force behind the postwar boom of innovation in American studio ceramics. The university system of training potters, hosting workshops and sharing information, he often said, stripped away the secrecy that the master/apprentice systems of Europe and Asia had imposed on coveted clay and glaze recipes and techniques. 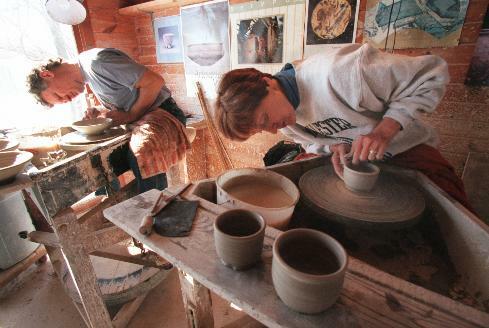 An amateur potter, Joan Mondale’s support of the crafts, in particular, developed early in her husband Walter Mondale’s term as Vice President of the United States. She became involved with the American Craft Council after visiting both the Museum of Contemporary Crafts (MCC) and the Baltimore Winter Market in 1977, the year her husband took office. After Mr. Mondale’s term ended, she continued to support the arts and crafts by serving on the American Craft Council Board of Trustees, as well as other boards including those of the Walker Art Center, Minnesota Orchestra, Kennedy Center for Performing Arts, and National Portrait Gal- lery. She was also instrumental in the devel- opment of the Textile Center and Northern Clay Center in Minnesota, two nationally recognized craft organizations. In 2004, the Textile Center honored Mondale for all that she has given to the arts by dedicating its largest exhibition space to her and calling it the Textile Center Joan Mondale Gallery. From 1972 to 1974, Angela Fina served NCECA, as a member of the Curriculum Committee. From 1974 to 1984, her service continued as Secretary and Member of the Executive Committee. In 1984 she was honored as a Fellow of the Council. 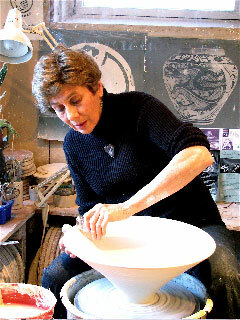 She held membership in the Asparagus Valley Potters Guild in Massachusetts from 1980 onwards and in Ikebana International since 1990. Even as she forged an independent studio life, Angela never lost her zest for sharing her knowledge through teaching. She led innumerable workshops at Pen- land School of Crafts in North Carolina, Brookfield Craft Center in Connecticut, and art centers in Washington, D.C.; Boul- der, Colorado; Long Island; New Jersey; and elsewhere around the country. She taught a sabbatical semester at Scripps College, Claremont, California and four months in the University of Georgia Stud- ies Abroad program in Cortona, Italy. She taught two semesters at The School for American Craftsmen and one at Miami University in Athens, Ohio. Angela’s passion and generosity were too large to be contained within her stu- dio alone; they also extended to her gar- den. Cohen recalls, “Every spring Angela would spread 20 bags of manure on her garden. Then the black plastic went down and the stakes went in for the tomatoes and beans. By summer, it looked like an Italian kitchen.” Angela shared this boun- ty of nature’s gifts as she did her knowledge of clay and glaze with friends and visitors. Kirk Mangus, the child of art teachers, grew up in the western Pennsylvania town of Sharon just miles from the Ohio border. As a teen, through his father’s encouragement, Mangus attended the Penland School of Crafts and the Cleveland Institute of Art, experiences that reinforced his interest in ceramics and art. 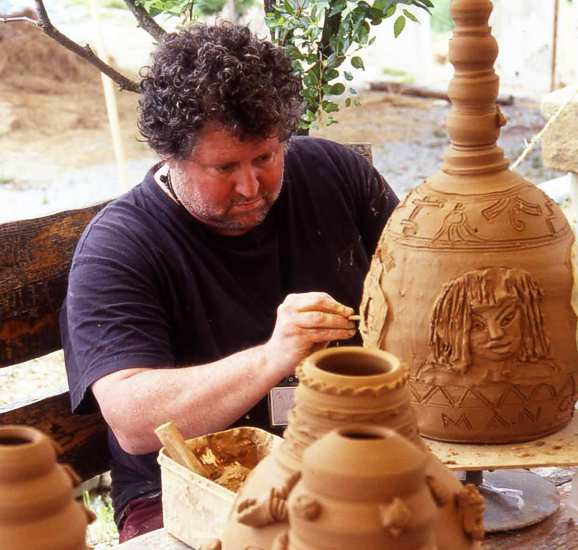 After earning his BFA from the Rhode Island School of Design, Kirk became one of the Clay Studio’s (Philadelphia) first artists in residence, before going on to earn his MFA at Washington State University in Pullman in 1979. Over a 28-year span on the faculty at Kent State, Mangus generated a life of artistic inquiry and output that may be unparalleled in its vibrant investigation of ceramics. In- spired by Tamba, Shigaraki, and mingei pots of Japan as well as ancient Chinese, Korean, and Persian sources, Mangus was prolific and protean. Describing his work as “useful, eccentric, and intricate, while feeling modern and ancient at the same time,” in his zeal to create, Mangus revealed a continuum be- tween ceramic cultures of the past and pres- ent. Anyone fortunate enough to live with his clay works has experienced the sense of im- mediacy with which he treated the material. To handle and drink from a Mangus cup is to be forever here, forever now with the moment of its creation. Regina Brown’s influence on NCECA was, in a word, transformative. Hers was the steady hand that provided consistency and professionalism to the organization’s op- erations. She was even more admired for her kindness to all who came to know her through the conference. Her dedication to the student experience and recognition that more than a conference, NCECA was embodied in the learning relationships that would shape the field for generations to come. These visionary values continue to serve as guiding beacons for the organization. Her generosity of spirit has touched many of us in different ways. If we think over the years or months that we have known Regina, we have many memories to treasure and warm our hearts and to bring smiles to our faces. She has been so self- less in her service to members of NCECA that she is a model for us all. Who else has a circle of friends that stretches around the globe? Who else but Reggie has a place in the hearts and minds of so many people who truly cherish and appreciate her for how she has enriched their lives? Who else has arms that have stretched around the clay community in an embrace of support and love?